May be you are thinking, I am kidding, no I am not actually, this is possible, few days ago I came to know this tips.But I have not share with you, because I have not use this tips, but few days ago I used this tips and my page views dramatically gets increased. May be you are getting excited to use this right, don't worry I will share with you to make it useful for you. Actually this is a script which we can use easily in blogger platform just follow me. Blogger Tips-<abbr title="Search Engine Optimization"> SEO </abbr>is very important to get traffic. This is one of the best script to make your article SEO friendly, how is it work okay.If I will see this script from HTML to compose format let me check, result you can also check. "Blogger Tips- SEO is very important to get traffic". The full form of SEO gets hide from normal user, but this thing can read Search Engine, which is going to help you, to make your article SEO friendly. I know you are right now interested to know, how would you get your blog post, on the top of the search engines, although no one can guarantee for this, I am not saying from my self, search engine giant Google says it.Because search engine shows different results with time, place and there are almost 200 parameters on which basis Google shows results. Now, I can not tell you right now all those 200 factors, not even to follow those 200 factors to get your blog post on the top, but at least you can follow few basic concepts, those concepts will help you to reach your blog post on the top. May be today after righting your blog post or tomorrow(If people will like your blog post and read the full article, which means your readers will spend more time on your blog, because among those factors this is also one of the factor on which basis search engine shows results for a query, i.e. time spending on your blog or website per users). Blog post heading is most important for getting traffic from search engines, so how to optimize it for getting best result, do nothing with it, just make it simple as people are searching and the heading would be which will increase CTR (Click Through Rate) [Let me make you understand about it this is the percentage of people click on your blog heading suppose that 35 people clicks on your blog heading out of hundred that means you will get 35% CTR] as well as ranking. Many bloggers thought that only writing great heading is enough but in real you have to work on whole blog post and this is the part of it, you need to put headings and that is awesome way to get engage readers as well as getting attention from search engines. More concentration and everything just more. Increasing authority and increase branding. I hope you got reasons behind following my tips in your next blog post, but don't stop by just clicking on publishing button, try to promote it on all media and if you want to get started with amazing e-mail marketing company then start today because its free for next 30 days, its Get Response personally I am using it for promoting my products- Get It Here. Do you know dear, these days, people don't want to read much they just wanted to get things without putting effort, so if you can provide anything which will reduce human comfort then your job done it will work for you and you will learn a lot, not only money but also fans, reputation and all those things which can not give you a normal job, that does not mean you will quit your job right now, no don't make that mistakes first try and when you are earning pretty stable income then you can quit your job and do it full time. Okay, let me share with you why you need to add image, because people can understand about it without putting effort, so adding image to blog post is just an amazing job. See, these links are really important to know, because as beginners may be you are not aware about these two links and if you think that you will take action in massive after knowing about these two links then don't, take action but slowly. 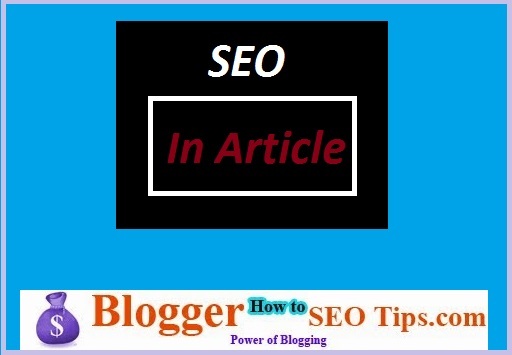 Actually; I have already written an article, where you can get almost all SEO tips to take your blog posts on the top of the search engine results. I know these tips are not all, but that is sure, if you will follow these tips you will definitely get better rank on Search Engine Results Pages(SERP), that is sure, I know, I am saying it twice, because it matter. One more important concept, I did share with you that is better content, you will provide better results you will get for long time. Is there any other SEO Tips to make your article SEO friendly.